The world is a noisy place. We do not realize this until we are actually looking for some quiet to listen to music or watch movies. Every single little background noise that we never noticed before becomes so painfully obvious that we have to focus on it. The only thing we can do is to sound proof the room. The first thing we have to remember is that sound proofing does two things. It keeps external noise out and keeps internal sound in. 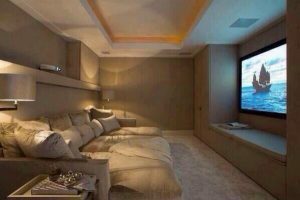 In this case, the room is for music and movies so that is enough. For a place like a recording studio we can also absorb any excess ambient noise as well with acoustic foam panels. Ideally, we need to block sound from coming in by adding mass to the walls. When adding new walls, use materials like concrete to deaden any noise. One way to soundproof a room is to use sound proofing foam over existing walls to add mass. This foam will block out a significant amount of noise. If there are windows and other potential air gaps, then use caulking agents and/or foam gaskets to cover any gaps. Often, these little gaps are where the sound will come through. The solution for doors is to use an automatic door bottom which seals the gap when the door is closed. The Foam Factory is a specialized store in various foam products including sound deadening foam, which are ideal for studios.